The big winner of the recent ‘Packett’s Tour de Dales’ charity bike ride was Bradford charity, ‘One in a Million’. Thanks to the efforts of 29 weekend warriors who swapped desks for bikes to battle it out over some of Yorkshire’s toughest roads, over £15,000 was raised. The two stage course took the riders from Packett’s Saltaire headquarters to T and R Theakston’s world famous brewery in Masham on Saturday 14th May – an 88 mile jaunt. After refreshing themselves at the brewery, they returned to Bradford on Sunday 15th May on a 100 mile route to finish at Bradford City’s Valley Parade Football Ground – home of ‘One in a Million’ charity. Over the course of the weekend the riders collectively covered in excess of 4,000 miles, including 3,500 feet of climbing. 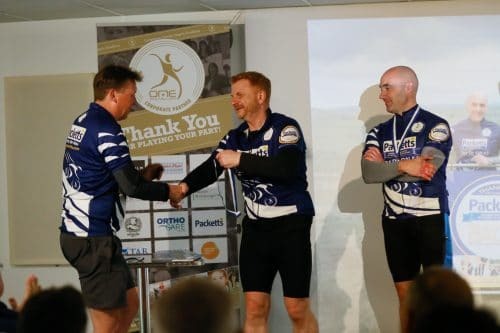 Amongst the ‘peloton’ was Packett’s Managing Director Marshall Sugden and former Bradford City footballer, Wayne Jacobs, now head of the ‘One in a Million’ charity.